As a technological civilization grows it may require ever-increasing amounts of energy, beyond what the planet can supply in fuel or what can be obtained as wind, solar, and geothermal power. More extreme measures may be necessary: building a structure that encompasses both the star and planet and harnesses the sun’s energy directly. A self-replicating craft used for space exploration examines a distant world. Lights on the dark side of an Earthlike exoplanet suggest a thriving advanced civilization. A moon appears in the foreground. In the distance are a Sun-like star and an inner planet. Conscious, intelligent entities made of photons rather than matter have been predicted by science fiction stories. With another trillion years or so for sentient beings to evolve, this could become more than conjecture. Life on Earth dwells on land and in the ocean, but only temporarily becomes airborne. In this hypothetical world, where heavy cloud cover obscures most of the planet’s surface, creatures with giant gas bags ride currents of air instead of currents of water. This opens up an exciting new habitat for life. Insects are among the most hardy and resilient organisms known. It is conceivable that insects similar to Earth’s have evolved on extrasolar planets too. On this water world, located in the star’s habitable zone, alien dragonflies swarm to a tree with night-blooming flowers. An Earthlike world rises above the limb of its cratered satellite. These bodies orbit a star in a binary system. 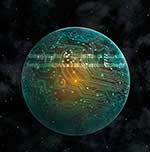 An Earthlike planet with a rocky moon elsewhere in the Milky Way is inhabited by a technologically advanced civilization. This civilization has positioned an array of telescopes on the dark side of the moon to detect signs of other life in the universe. The "0s and 1s" represent the binary code used by computers. Humans on Earth use a large amount of computing time and power to process data from space for signs of intelligent life. There is a possibility that an alien civilization may communicate in a binary code as well, sending such messages toward Earth. At the bottom of an alien ocean smokers similar to those on Earth can be found. Life forms are abundant here. Despite the heat and pressure they have learned to adapt and survive. Curious rock formations dominate this calm ocean. If it weren't for the two suns in the sky and the unusual moon, one might think this were an exotic tropical beach on Earth. This radio telescope dish is a huge hibiscus flower, with the pistil pointing up toward the sky. Far off in space is a star which represents another planet inhabited by an intelligent life form. This image is available as a framed miniature. The extraterrestrial civilization, represented by the small purple flower, has developed radio technology and sends a radio signal out into space. 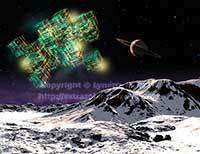 The signal travels toward Earth and will be received by the large radio telescope here. It is theorized that living bacteria on rocks ejected from their planet of origin into space might survive the journey long enough to seed another world. While this is unlikely to occur over large distances, such as from one solar system to another, it may happen between planets within the same solar system. This image conceptualizes this idea, showing bacterial colonies on an asteroid falling toward Earth. Some new SETI searches are now looking for alien messages at optical frequencies rather than radio wavelengths. These could be in the form of pulsed laser beams.